At first glance, the real benefits of cloud computing may not be apparent with all the hype and buzzwords out there. Based on our extensive experience with cloud solutions, here are the top 10 benefits of working in the cloud. Above all, one of the most significant benefits is the peace of mind you get from having a reliable cloud solution in place. Software licensing savings. It is much cheaper to pay for the use of a cloud application per user than to license individual software for each person on a PC-by-PC basis. It can cost up to $399 per user for Microsoft Business Office Professional — not to mention the periodic update costs. This can get expensive and complex with various licensing agreements. Throw in the expense of installation for each computer along with installing periodic updates and costs quickly escalate on a per PC basis. Reduced support personnel needed. Since the support of the hardware and software are provided by the cloud provider, far fewer, if any, internal-support people are needed. Reduction in operational costs. 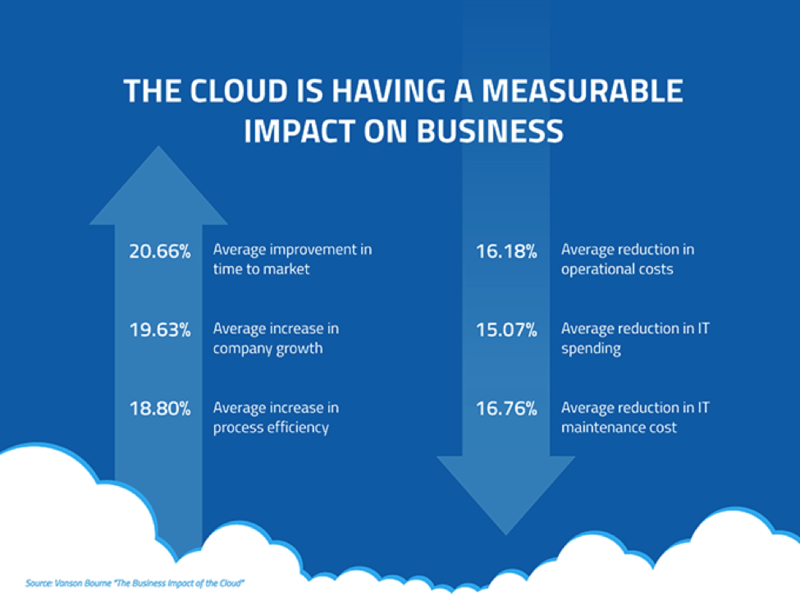 According to Sky High Networks, the average firm's operational savings by moving to the cloud is 16.18%. Sky High Networks also found that another one of the benefits of the cloud was it increases the average company's growth by 19.63% over its nearest competitors who are still using on premise software. If you can get things done faster with fewer people, it indeed pays off. Cloud computing automatically creates a duplicate of your data on load-sharing computers and redundant storage. So if one of the systems were to fail, the program would immediately and automatically be taken over by the next processor in the cloud. Growth Institute points out that rather than needing expensive systems — whether it's large computers or networks of servers — those are not required internally since the computing power is provided by the cloud provider. This can result in a substantial reduction in CAPEX and let you leverage your assets in other areas of your business. Another benefit of the cloud is improved security. Cloud providers invest in tight security from the very beginning. Cloud systems are inherently designed to handle remote workers from around the world. As a result, they provide a significant improvement over the internal security of most companies. It's not unusual when a system needs to add hardware capacity for it to be expensive and an ordeal. It can be a lot of late night upgrades and reboots to get that extra capacity — not to mention the capital requirements for the new equipment. One of the best benefits of using a cloud solution is that systems scale in the background and automatically. Without any interruptions to your cash flow, your users, or your support staff! It usually takes five talented and expensive full-time people to monitor three different shifts during the week and the weekends. You no longer need this in house with a cloud solution because the cloud provider does that for you. Someone can be notified on your staff if a problem occurs, but no one at your firm needs to do any onsite monitoring any longer. When a cloud-based system does fail, it is automatically taken over by other systems in the cloud and is transparent to your users. No data is lost, and no work-in-process is lost. It is seamless and virtually invisible. Cloud providers are so confident of their solution they will provide SLAs (Service Level Agreements) guaranteeing 99.99% uptime. This reliability is very expensive for an individual company to provide internally, yet is baked into a cloud's architecture. Sky High Networks also discovered that there is an average of a 19.63% improvement in time-to-market. Being first-to-market can make a huge difference in market share. You can get first mover advantage over your competition as a result. As you can see, while we've only listed a few benefits, having your systems in the cloud is a wise move. If you haven't considered using a cloud solution for your company, take the time to seriously evaluate whether or not a cloud solution is right for your situation. Call us at (312) 448-7406 for a free planning session and get the help you need to evaluate the benefits of a cloud solution. If you decide to move forward, we can also help with your cloud migration planning, implementation, and the quality of your transition. With hundreds of successful cloud migrations under our belts with brands such as Grubhub, MIT, Salesforce, we've tackled and solved some of the toughest challenges out there. Just ask for details when you call! Author Bio: Boston native, rugby player, and Google Cloud Account Executive. 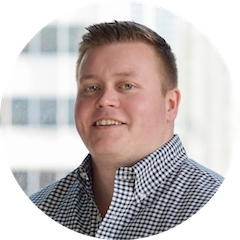 Kevin has been in technical sales for years, helping clients strategize and find the best solutions for their organization.